While at the opening session, reality began to set in and I had my first flash of panic -- 130 people will be attending our presentation! The next hour leading up to the presentation was absolutely worst than Dante's Inferno as I felt I was going through more than the 3 realms of death myself, with no hopes of being rescued by Virgil. After the opening of our presentation, things began flowing and growing progressively smooth with time being our only enemy. We had a good number of questions throughout and received positive feedback by the end of the session. However, we went over the scheduled time by 4 minutes. At the end of the Customizing presentation we were off the hook for the day and went to the Oak room in the Horizon building to work on Day 2's Troubleshooting sessions -- we were doing a 10:30 and a 1:30 repeat. We were joined by MVP Leslie Vail who assisted us with baselining the presentation timing and refining the slide deck. Her vast experience as a Microsoft Certified Trainer was a big asset in the process. NOTE: we had an extra topic on "Certified for Microsoft Dynamics GP" in the slide deck that did not make it into the actual Troubleshoting session presentation, but that topic can be found in the Downloads section of this post. 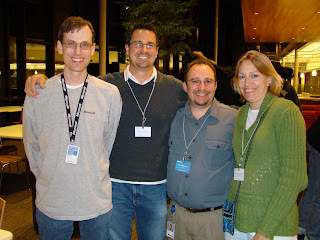 The evening began with Study Halls where David and I had the opportunity to interact with partners and Microsoft staff on a variety of development topics and met up with a few long time friends. After Study Hall, we were joined by Constance Guilleland (Q-Factor) and Rob Wagner (Microsoft) to discuss some of the new Microsoft Word integration features available in GP 11 and provide some ideas on document security management. After our meeting with Rob, we went back to the Ramada, where we met up with Leslie to continue refining the session... time went by and we were done by 1:30 AM. My THANK YOU goes out to all of you who expressed your simpaty for this blog and its contribution to the partner and customer communities. For materials of the Customizing the Microsoft Dynamics GP Client with Visual Studio Tools, Dexterity and Modifier with VBA, click here.